I aspire to meditate daily.Within my normal routine, I may skip a couple of times here and there, but mostly I get to it every day. But when my far-flung family gathered in one city, I rearranged my priorities. My parents who live in Florida, my son who lives in Los Angeles, my son and his girlfriend who live in Chicago, and myself and my husband who live in Cleveland, all made our way to New York City to welcome the newest member of the family into the world: my new baby granddaughter. Meditation requires just twenty minutes of time and a solitary space within which to find stillness, but I was not willing to chop off any of my prescious minutes to devote to a solitary activity. I didn't want to take a chance on missing a moment of available time with my parents, children, husband, granddaughter. It's not that there was not a twenty minute block available here or there (of course there was), but I never knew when my daughter might call and say the baby had just woken up or just been fed and was ready for a visit. It's the spontanteity I was not willing to give up. So for the past couple of weeks, I've meditated only a couple of times and here I am trying to figure out what effect this has had on me. If there's one thing meditation has taught me, it's that you can't really figure out how meditation does and does not change your life. Conversely, it's not so useful to try to figure out what effect lack of meditation has had. I quiz myself: Am I more irritable? More anxious? Less productive? In other words, am I a different sort of person when I meditate and when I don't? It may be a question without an answer, but nevertheless it's the question foremost on all of our minds. Will this meditation thing do something relevant and immediate for me? I can see a trail of my accomplishments from the time I began to meditate almost a year ago until now and if that is a measure of change, I can see those things. But I can't see what would have happened had I not started to meditate. I feel powerful when I refuse to accept coincidence and am open to the synchronicity that surrounds me, but I don't know how things would have played out were I still a person that noticed coincidence and then went blithely on ignoring the connections. Maybe all the meditation I've done over the course of the past year has built up a reserve in me so the gap in my meditation schedule was of little matter. Mind the gap. 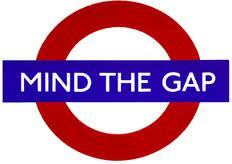 Cope with the gap. Meditate again.